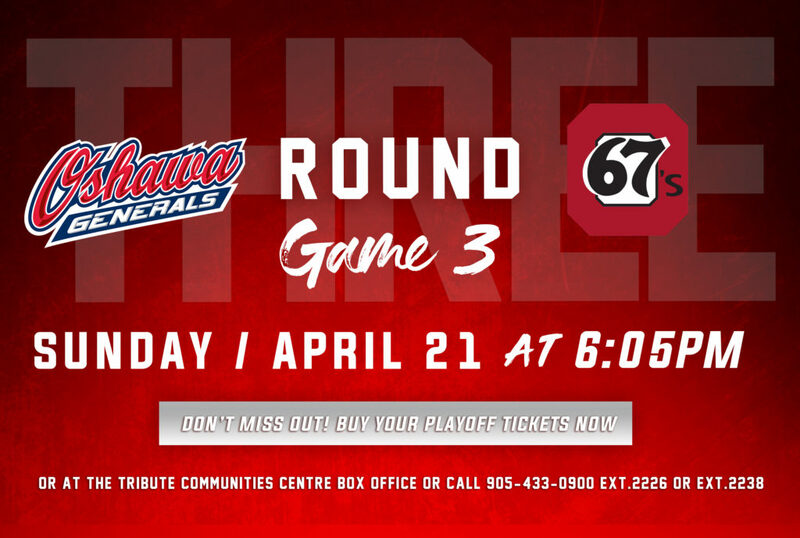 The Generals arrived back in Oshawa to open their back to back at home this afternoon against the Kingston Frontenacs at the Tribute Communities Centre. The Gens came into the game with a 16-8-2-0 record after taking down the Guelph Storm on the road yesterday and picking up their sixth win in the past seven games. The team looked to keep up the winning trend today as they faced off against the Fronts at home. The Gens hit the ice ready to play, sustaining offensive zone pressure early and limiting Kingston’s chances. 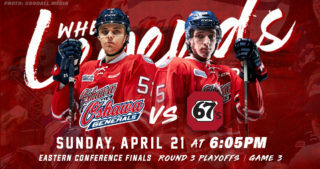 At just five minutes into the period, the Gens efforts paid off with Allan McShane ripping a shot from the slot past the Fronts to put Oshawa up 1-0. The assists on the tally went to Kyle MacLean and the Gens’ newest addition Anthony Salinitri, giving him his first point as a General. 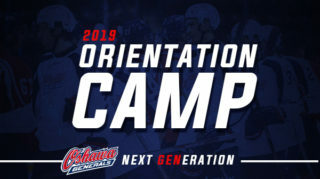 After the goal, the Gens kept up their relentless pressure and were once again rewarded for their strong play with Giovanni Vallati blasting a wrister from the point through traffic and into the back of the net, increasing Oshawa’s lead to 2-0. The Gens received the first penalty of the game after the goal to give the Frontenacs a powerplay. However, after each team took another penalty, the play went to 4-on-3 for a minute at the halfway point of the period. With a strong kill, the Gens fought off the Fronts and all penalties expired with no change in the score. With just under two minutes left in the period, the Gens took two penalties back to back to put them down 5-on-3. With a big block from Anthony Salinitri and some key stops from Gens goaltender Kyle Keyser, the Gens escaped to the intermission up 2-0. The Gens opened the period by holding off the Fronts offense and killing the remainder of the 5-on-3. 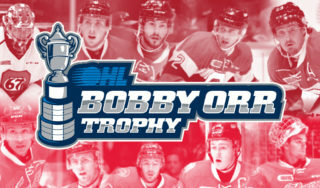 However, Oshawa got into more penalty troubles with another pair of penalties coming right after the previous two expired, putting them back down by two men. Getting the help of some big saves from Kyle Keyser, the penalty kill proved successful yet again with the Gens killing off both penalties and retaining their lead. 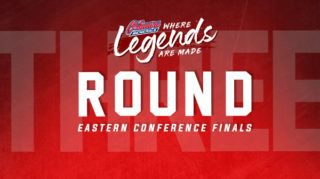 At the halfway point of the period, Gens forward Nick Wong had an amazing opportunity on a solo effort in which he drove hard to the crease, nearly putting the puck behind the Fronts goalie but it barely managed to stay out of the net. Building off the chance, Oshawa pinned Kingston in their end for several minutes toward the end of the period, generating lots of chances and looks on net. Keeping up the pressure, the Gens made the Frontenacs pay by potting their third goal of the night off a beautiful tic-tac-toe passing play between MacLean, McShane, and Vallati who finished the play by burying his second of the night. With the late goal, Oshawa headed into the final frame of the game with a commanding 3-0 lead. The Gens opened the period hungry for more, with Ty Tullio taking a perfect wrist shot top corner of the Fronts net, extending their lead to 4-0. The goal marked Tullio’s fifth of the season, with the assists going to Eric Henderson and Danil Antropov. A minute later, the Gens were called for a tripping penalty to put them down a man. The hot penalty kill kept up their strong play, killing off their eighth penalty of the game. Right after the penalty expired, the Gens were sprung on a 3-on-1 break in which Serron Noel passed the puck back to the slot where Allan McShane ripped home his second goal of the game to go up 5-0. After getting a four-minute high sticking penalty just after the halfway mark of the third, the Gens continued their PK efforts with another successful kill. 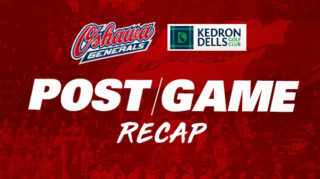 With the game winding down to its final minutes, the Gens kept the Fronts off the board and secured a shutout for Kyle Keyser in a big 5-0 win. With a huge 2-point effort and an offensive explosion this afternoon, the Gens will look to continue their winning ways when the team finishes off their home double header tomorrow against the Windsor Spitfires in the 21st annual Teddy Bear Toss game!